Brown leather office chairs are hard to find. This one happens to be a great one. It features a soft and supple brown bonded leather with a quilted pattern on the seat and back to give it a traditional style. This plush leather office chair has cushions that are double stitched for durability with contrasting stitching. It is also very heavy duty and holds 400 lbs! Adjustments include pneumatic seat height and tilt with tilt tension adjustment to allow for a more relaxing recline. The 812-LX is also Greenguard certified for children and schools. The sturdy five-star base and padded arms have an attractive champagne powder coating. Limited lifetime warranty from OFM. Seat Size: 24”W x 22.50”D. Back Size: 24”W x 29”H. Seat Height: 19”- 23”H. Overall Height: 45"- 49". Overall Width: 30". Overall Depth: 32.5". Base Size: 28". Meets or exceeds ANSI/BIFMA safety standards. 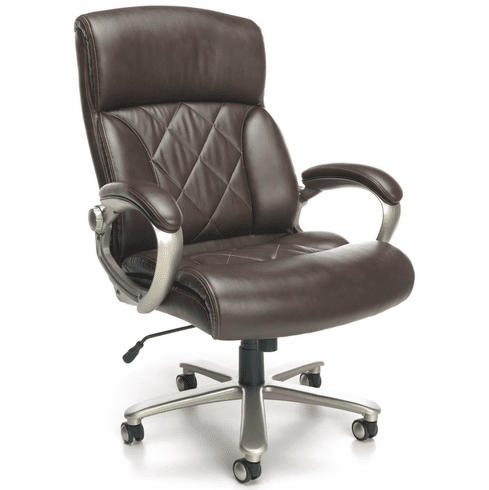 The 812-LX, plush brown leather office chair ships out in 1-2 business days from NC.